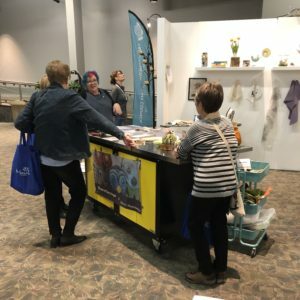 When the call for applications to be the Craftsperson in Residence in the Saskatchewan Craft Council’s booth at HomeStyles Home Show came out I jumped at the chance. I love volunteering for the SCC so I knew that hanging out in the booth would be fun. Hanging out and stitching would be even more fun. 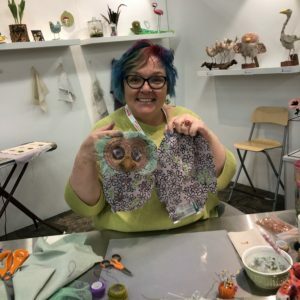 My goal over the course of the four days was to create a large sized owl incorporating a plethora of techniques. Typically, a piece like this takes about 25 hours to complete. I began with dyeing the fabric at home prior to the show. I used red cabbage, avocados and blueberries. 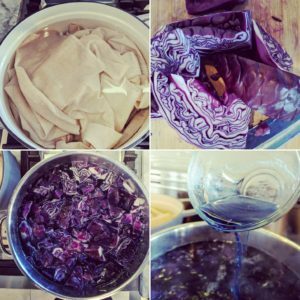 I’ve been so inspired by the work of SCC Juried artist Kathleen O’Grady who’s natural dyeing techniques could be a fourth-year chemistry class! The colours that she can achieve are beautiful. My technique is haphazard, but I can achieve a lovely range of colours with simple kitchen ingredients and produce (it helps tremendously that none of my fabrics will be worn or washed). On the first evening of the show I carved a block and printed my fabric. I took four years of printmaking instruction while living in Seattle, Washington and enjoy using a variety of techniques. For fabric printing I like the ease of use of the blocks made of a synthetic rubber-like material. Simple to carve and flexible enough to easily print on fabric. I use etching or Speedball block printing inks, they dry overnight and clean up with water. Printing the fabric gathered quite a crowd. It isn’t something that you often see demonstrated. On the Friday of the show I heat set my fabric and cut out the pattern. 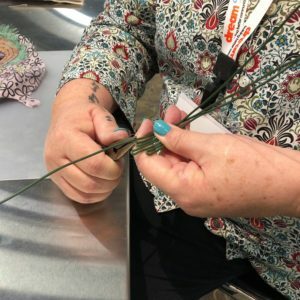 I make all of my own patterns and have developed a few of my own techniques for 3D construction. My patterns aren’t overly complicated but a simpler, less realistic style is what I’m going for. This enables me to focus on the materials used to make the piece. From there I began to focus on embellishments including various techniques, such as basic embroidery, beading, applique, reverse applique and construction. Rather than decide ahead of time exactly which materials I would use, I brought a huge variety with me. People visiting my table loved to look through the threads, fabrics, buttons and odds and ends that I collect. 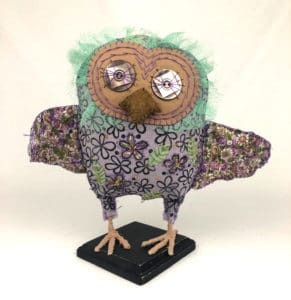 The goal of having a Craftsperson in Residence was to “educate the public about what process means in the formation of a finished craft work.” I believe that visitors did come away with a realization of the skill, time and material that goes into making a single piece. Would I do it again? In a heartbeat. 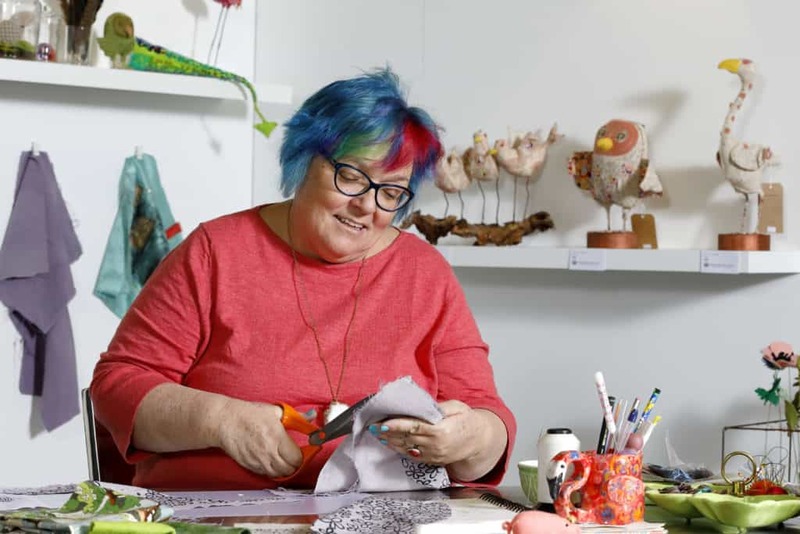 I often worked past my shift, losing track of time, just like in my real studio. Visitors were friendly, interested and spent time in the SCC booth after chatting with me. Many folks working at the show in other booths or for Prairieland came back several times to check on my progress. I enjoyed explaining my process to the SCC members who volunteered in the booth. I’d like to thank the SCC for this amazing opportunity. Thank you to Alexa Hainsworth for all your help and support throughout the weekend. Thank you also to Sydney Luther for having her camera at the ready (many of the photos in this article are by Sydney!). I look forward to passing the Craftsperson in Residence tiara on to next year’s choice. So cool! So good to see all the steps and work that went into this!